For the original posting of this, I used a jar of Trader Joe’s Dark Morello cherries. However, I would suggest using fresh sour cherries (or add a little bit more lemon, if using sweet) if at all possible. It’s just better. But the jarred works in a pinch. I used them in a trifle, but these would be excellent as a middle layer of a cake, or simply spooned on top of vanilla ice cream. Combine water, sugar and lemon juice in heavy medium saucepan. Add vanilla (or scrape seeds from vanilla bean into saucepan; add bean), and a splash of sherry if you’re using it. Bring to a boil over high heat, stirring until the sugar dissolves. Boil until thin syrup forms, about 7 minutes. Reduce heat to medium; add cherries. Stir 3-5 minutes. At this point, cook until you like how much the cherries have broken down. Taste as you go. You can’t go wrong. The longer you cook, the more jammy they will be, but it’ll take awhile for them to really really break down, especially if you’re using the jarred ones. 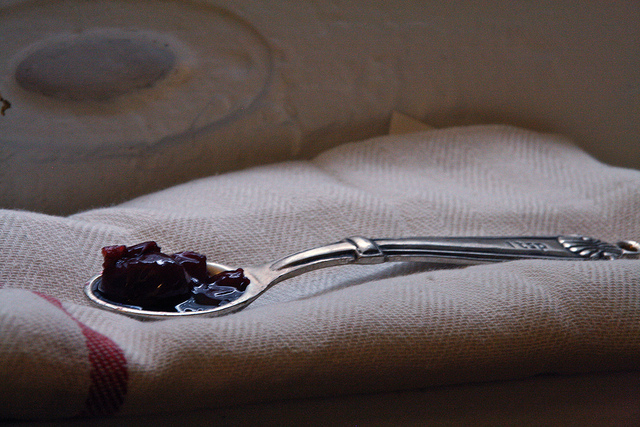 Cool the compote, then cover and chill until cold.